Sajad Gul visits Chandergeer village in Hajan to understand what happened on 18 November in an encounter in which six militants of Lashkar e Toiba (LeT) were killed. Chandergeer is a little known village in Hajan area of Bandipora district. On Saturday 18 November, the village shed it’s anonymity for the first time when news broke of an encounter between militants and government forces at a house in Chandergeer Jamia Mohalla. Unusually, the encounter didn’t last that long. The police and army establishment claimed that it had killed six militants of Lashkar-e-Toiba, including the nephew of Mumbai attack mastermind Zakir-ur-Rehman Lakhvi. One Indian Air Force (IAF) Garud commando was also killed in the encounter and another army personal was injured. The following day, I visited Chandergeer. Around a dozen shops in this non-descript village of nearly 3000 souls, were shut. Locals told me that the shops had been closed since the encounter began. “It was the first such encounter in this village,” they said, sitting on shop-fronts. Heaps of boulders and stones were scattered on the rough roads. Everyone was talking about the encounter that had left six militants dead. At the site of the encounter, surrounded by tall poplar trees, people were talking amongst themselves on how exactly the encounter broke-out. A dozen people were listening intently to one Abdul Rehman Parray, a 59 year-old man, who was explaining at length how the encounter started. Abdul Rahman told me that on 18 November, he was sitting with his family inside his house at Chandergeer, when around 3 p.m. sudden bullet shot sounds startled them. “I work as a labourer. But I wasn’t feeling well on that day and had decided to stay home. I was sitting with my children when at 3 p.m. bullets pierced my house and into our room,” he said. “The bullets pierced through the mud walls,” he added. Amid the din of rattling gunfire, Rehman’s elder daughter fainted as he ordered all his family members to crouch on the ground. “It was scary. I hurriedly managed to peer through the half-broken window and I saw a huge posse of armed forces rushing towards our house,” he said. “We began shouting to them to stop firing to let them know that there no militants in the house but only family members,” said. Abdul Rehman says as they tried to come out from their home, the forces trained their guns towards them. “One bullet went straight through the window pane and hit the mud wall,” recalls Abdul Rehman. When the armed forces saw the family, including toddlers crying and shouting they stopped firing. “But they didn’t let us escape, they beat and harassed us. They didn’t even spare my elder daughter, who is pregnant and they beat her to pulp. She fractured a bone,” Abdul Rehman said. 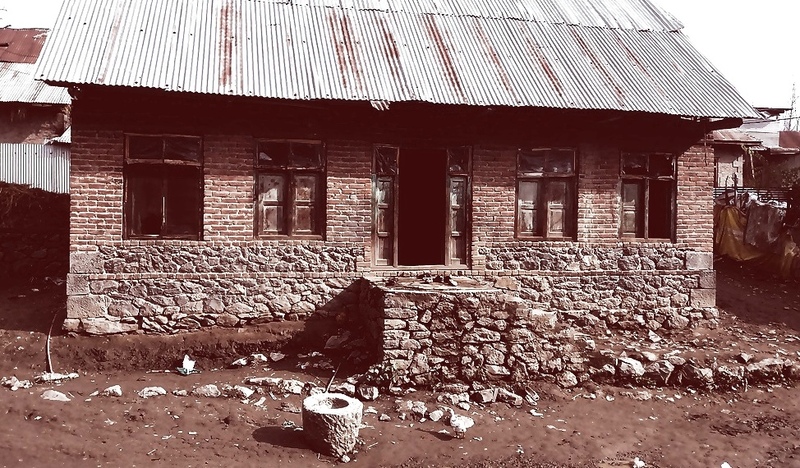 Outwardly, the one story mud-house of Abdul Rahman doesn’t look like a militant hideout. The house is surrounded from the back by paddy-fields and a few poplar trees. A few yards away from the house is the family cowshed, whose back-wall was pumped by bullets on the day of the encounter. “We we were not informed by forces that militants were around our house and that we should evacuate. My entire family was weeping in front of me and I couldn’t do anything. They beat us all. I begged them to leave us alone, but they held me by my beard. Two family members were taken away and detained at police station Hajan,” Rahman said. The other villagers said that forces went berserk in the village and damaged window panes, new washroom fittings, electricity fittings and some refrigerators. “They even tore textbooks of our school going children,” the villagers said. Abdul Rahman says that he and has family has nothing to do with militancy but still they were harassed and beaten on the day of the encounter. “Me and my family remain busy with agricultural activities. We don’t have any political affiliation with anyone, so how could we give shelter to militants,” he said. Abdul Rahman’s lone daughter told me that they don’t have sufficient space for themselves at their small house, ‘so how can we give shelter to militants.’ “They are accusing us that we have been sheltering militants from many months but that is not true,” she said. The Parray family maintains that they have not provided shelter to any militants in the past or on the day of the encounter. “Had there been militants at our house they might have been killed inside our house or in our courtyard. But the fact is the militants were killed some 200 yards away from our house,” Rehman said. In the Chandergeer’s Bhat Mohalla, I met several families who accused police of beating locals on the day of the encounter and vandalizing property. “Army fired indiscriminately on the residential houses and you can see roofs of the houses pored by bullet-shots,” they said. The villagers showed me videos on their cellphones of army vandalizing houses and beating locals. “We couldn’t do anything, as we were helpless,” they said. A 37-year-old man from the village, who wished anonymity, said that armed forces entered his house and began searching. “They asked us to come out. We were forcibly brought out as they fired tear gas shells and pellets inside the house. One tear gas shell exploded on a mattress and it caught fire,” he said while displaying the heap of burned mattress and floor-matting. He said that the transmission wires were also fired upon. “Electricity to the village was snapped soon after the encounter started. Everything was in chaos,” he added. On the day of the encounter, locals said, that the army had first arrived in the village in private vehicles dressed in civvies and had left their vehicles at some distance away from the encounter spot. Soon after the encounter was over, and armed forces had left the village, people had found a broken human-finger and cap (a Muslim prayer cap) at the encounter site. The villagers said they buried the finger and the cap ‘without knowing whether it was of a militant or an Army man’. On the day of the encounter, media-men from Bandipora were not allowed by the government forces to capture the encounter and neither were the dead bodies of the slain militant shown to them. “Instead of allowing us to cover the encounter, we were threatened and not allowed to take any pictures,” said a Bandipora journalist working with an Indian TV channel. Ghulam Mohammad (name changed), a 36-year-old from Chandergeer told me that as word of the encounter spread through the village, people began arriving at the encounter site to protest. “Although it was sun down, all the villagers had gathered near the encounter site and some people had come from other adjoining villages and they were all raising slogans,” he said. “The army didn’t warn us about the encounter. They came without announcing and laid a cordon and search operation (CASO),” said Abdul Hamid Bhat a local, who showed this reporter his house whose window panes were broken. The government claimed that on 18 November, six militants were shot dead at the Chandergeer encounter including Osama Jangvi alias Owaid ‘nephew of Zakir-ur-Rehman, Abu Zargaam, Mehmood Bhai (divisional commander of LeT in Hajan), Abu Qetaal, Abdullah and Maviya, all residents of Pakistan. However the family of Abdul Rahman Parray told me that the government claim that militants were holed in their house is ‘completely false and act of deceit’. One of the militants claimed to be killed in the encounter was top Lashkar commandar Mehmood bhai. The police administration was still in throes of celebrating this ‘feat’, when the enigmatic Mehmood Bhai made a bold appearance in Hajan town four days after the encounter. On 21 November, two bike borne militants appeared in main town Hajan in broad day light and fired few aerial shots. One was identified as Mehmood bhai and another couldn’t be identified as he was veiled. Word spread like fire in the area and people thronged Hajan town, but true to their modus-operandi the bike-borne militants had escaped from the spot. Slogans were raised in favour of militancy and the Lashkar commander. A youth from Hajan said that Mehmood bhai was lifted on shoulders amid anti-India and pro-militant slogans. People’s grief turned into joy as they saw the Lashkar commander waving his hands to the people, he said. 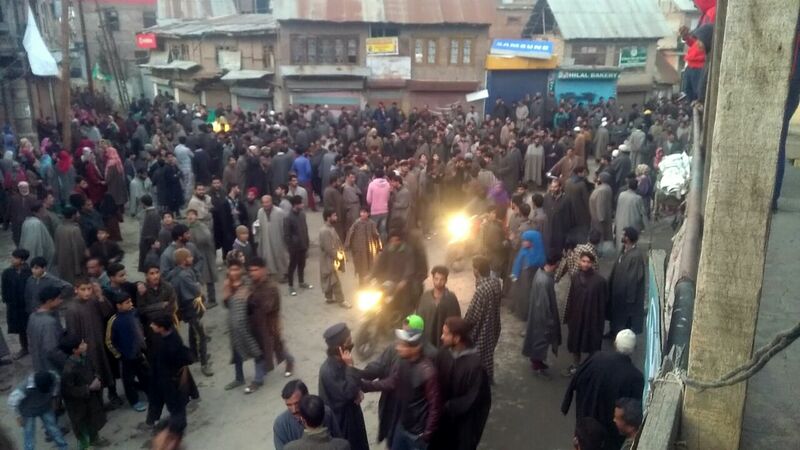 Following the killing of six militants, as their bodies were whisked away by police to Baramulla, hundreds of people offered in-absentia funeral prayers at Hajan town, marking yet another open support for the militants in this once Ikhwan dominated town. As hundreds of people assembled at Jamia Masjid Khos Mohalla in Hajan, the drift in the political landscape of this town marked a significant landmark. Sajad Gul is pursuing Journalism from Baramulla Degree College.